"Athenian War" redirects here. For the earlier war beginning in 460 BC, see First Peloponnesian War. For the book by the Greek historian Thucydides, see History of the Peloponnesian War. The Peloponnesian War (431–404 BC) was an ancient Greek war fought by the Delian League led by Athens against the Peloponnesian League led by Sparta. Historians have traditionally divided the war into three phases. In the first phase, the Archidamian War, Sparta launched repeated invasions of Attica, while Athens took advantage of its naval supremacy to raid the coast of the Peloponnese and attempt to suppress signs of unrest in its empire. This period of the war was concluded in 421 BC, with the signing of the Peace of Nicias. That treaty, however, was soon undermined by renewed fighting in the Peloponnese. 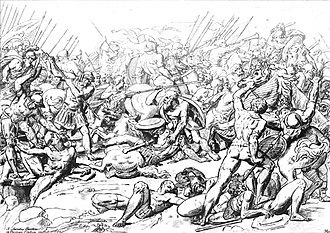 In 415 BC, Athens dispatched a massive expeditionary force to attack Syracuse, Sicily; the attack failed disastrously, with the destruction of the entire force in 413 BC. This ushered in the final phase of the war, generally referred to either as the Decelean War, or the Ionian War. In this phase, Sparta, now receiving support from the Achaemenid Empire, supported rebellions in Athens's subject states in the Aegean Sea and Ionia, undermining Athens's empire, and, eventually, depriving the city of naval supremacy. The destruction of Athens's fleet in the Battle of Aegospotami effectively ended the war, and Athens surrendered in the following year. Corinth and Thebes demanded that Athens should be destroyed and all its citizens should be enslaved, but Sparta refused. The term "Peloponnesian War " was never used by Thucydides, by far its major historian: that the term is all but universally used today is a reflection of the Athens-centric sympathies of modern historians. As prominent historian J. B. Bury remarks, the Peloponnesians would have considered it the "Attic War". The Peloponnesian War reshaped the ancient Greek world. On the level of international relations, Athens, the strongest city-state in Greece prior to the war's beginning, was reduced to a state of near-complete subjection, while Sparta became established as the leading power of Greece. The economic costs of the war were felt all across Greece; poverty became widespread in the Peloponnese, while Athens found itself completely devastated, and never regained its pre-war prosperity. The war also wrought subtler changes to Greek society; the conflict between democratic Athens and oligarchic Sparta, each of which supported friendly political factions within other states, made civil war a common occurrence in the Greek world. Ancient Greek warfare, meanwhile, originally a limited and formalized form of conflict, was transformed into an all-out struggle between city-states, complete with atrocities on a large scale. Shattering religious and cultural taboos, devastating vast swathes of countryside, and destroying whole cities, the Peloponnesian War marked the dramatic end to the fifth century BC and the golden age of Greece. As the preeminent Athenian historian, Thucydides, wrote in his influential History of the Peloponnesian War, "The growth of the power of Athens, and the alarm which this inspired in Lacedaemon, made war inevitable." Indeed, the nearly fifty years of Greek history that preceded the outbreak of the Peloponnesian War had been marked by the development of Athens as a major power in the Mediterranean world. Its empire began as a small group of city-states, called the Delian League—from the island of Delos, on which they kept their treasury—that came together to ensure that the Greco-Persian Wars were truly over. After defeating the Second Persian invasion of Greece in the year 480 BC, Athens led the coalition of Greek city-states that continued the Greco-Persian Wars with attacks on Persian territories in the Aegean and Ionia. What then ensued was a period, referred to as the Pentecontaetia (the name given by Thucydides), in which Athens increasingly became in fact an empire, carrying out an aggressive war against Persia and increasingly dominating other city-states. Athens proceeded to bring under its control all of Greece except for Sparta and its allies, ushering in a period which is known to history as the Athenian Empire. By the middle of the century, the Persians had been driven from the Aegean and forced to cede control of a vast range of territories to Athens. At the same time, Athens greatly increased its own power; a number of its formerly independent allies were reduced, over the course of the century, to the status of tribute-paying subject states of the Delian League. This tribute was used to support a powerful fleet and, after the middle of the century, to fund massive public works programs in Athens, causing resentment. Friction between Athens and the Peloponnesian states, including Sparta, began early in the Pentecontaetia; in the wake of the departure of the Persians from Greece, Sparta attempted to prevent the reconstruction of the walls of Athens (without the walls, Athens would have been defenseless against a land attack and subject to Spartan control), but was rebuffed. According to Thucydides, although the Spartans took no action at this time, they "secretly felt aggrieved". Conflict between the states flared up again in 465 BC, when a helot revolt broke out in Sparta. The Spartans summoned forces from all of their allies, including Athens, to help them suppress the revolt. 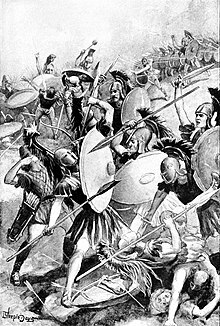 Athens sent out a sizable contingent (4,000 hoplites), but upon its arrival, this force was dismissed by the Spartans, while those of all the other allies were permitted to remain. According to Thucydides, the Spartans acted in this way out of fear that the Athenians would switch sides and support the helots; the offended Athenians repudiated their alliance with Sparta. When the rebellious helots were finally forced to surrender and permitted to evacuate the state, the Athenians settled them at the strategic city of Naupaktos on the Gulf of Corinth. In 459 BC, Athens took advantage of a war between its neighbors Megara and Corinth, both Spartan allies, to conclude an alliance with Megara, giving the Athenians a critical foothold on the Isthmus of Corinth. A fifteen-year conflict, commonly known as the First Peloponnesian War, ensued, in which Athens fought intermittently against Sparta, Corinth, Aegina, and a number of other states. For a time during this conflict, Athens controlled not only Megara but also Boeotia; at its end, however, in the face of a massive Spartan invasion of Attica, the Athenians ceded the lands they had won on the Greek mainland, and Athens and Sparta recognized each other's right to control their respective alliance systems. The war was officially ended by the Thirty Years' Peace, signed in the winter of 446/5 BC. The Thirty Years' Peace was first tested in 440 BC, when Athens's powerful ally Samos rebelled from its alliance with Athens. The rebels quickly secured the support of a Persian satrap, and Athens found itself facing the prospect of revolts throughout the empire. The Spartans, whose intervention would have been the trigger for a massive war to determine the fate of the empire, called a congress of their allies to discuss the possibility of war with Athens. Sparta's powerful ally Corinth was notably opposed to intervention, and the congress voted against war with Athens. The Athenians crushed the revolt, and peace was maintained. The more immediate events that led to war involved Athens and Corinth. After suffering a defeat at the hands of their colony of Corcyra, a sea power that was not allied to either Sparta or Athens, Corinth began to build an allied naval force. Alarmed, Corcyra sought an alliance with Athens, which after debate and input from both Corcyra and Corinth, decided to swear a defensive alliance with Corcyra. At the Battle of Sybota, a small contingent of Athenian ships played a critical role in preventing a Corinthian fleet from capturing Corcyra. In order to uphold the Thirty Years' Peace, however, the Athenians were instructed not to intervene in the battle unless it was clear that Corinth was going to press onward to invade Corcyra. However, the Athenian warships participated in the battle nevertheless, and the arrival of additional Athenian triremes was enough to dissuade the Corinthians from exploiting their victory, thus sparing much of the routed Corcyrean and Athenian fleet. Following this, Athens instructed Potidaea in the peninsula of Chalkidiki, a tributary ally of Athens but a colony of Corinth, to tear down its walls, send hostages to Athens, dismiss the Corinthian magistrates from office, and refuse the magistrates that the city would send in the future. The Corinthians, outraged by these actions, encouraged Potidaea to revolt and assured them that they would ally with them should they revolt from Athens. During the subsequent Battle of Potidaea, the Corinthians unofficially aided Potidaea by sneaking contingents of men into the besieged city to help defend it. This was a direct violation of the Thirty Years' Peace, which had (among other things) stipulated that the Delian League and the Peloponnesian League would respect each other's autonomy and internal affairs. 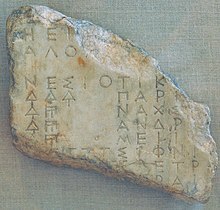 A further source of provocation was an Athenian decree, issued in 433/2 BC, imposing stringent trade sanctions on Megarian citizens (once more a Spartan ally after the conclusion of the First Peloponnesian War). It was alleged that the Megarians had desecrated the Hiera Orgas. These sanctions, known as the Megarian decree, were largely ignored by Thucydides, but some modern economic historians have noted that forbidding Megara to trade with the prosperous Athenian empire would have been disastrous for the Megarans, and have accordingly considered the decree to be a contributing factor in bringing about the war. Historians that attribute responsibility for the war to Athens cite this event as the main cause for blame. At the request of the Corinthians, the Spartans summoned members of the Peloponnesian League to Sparta in 432 BC, especially those who had grievances with Athens to make their complaints to the Spartan assembly. This debate was attended by members of the league and an uninvited delegation from Athens, which also asked to speak, and became the scene of a debate between the Athenians and the Corinthians. Thucydides reports that the Corinthians condemned Sparta's inactivity up to that point, warning the Spartans that if they continued to remain passive while the Athenians were energetically active, they would soon find themselves outflanked and without allies. The Athenians, in response, reminded the Spartans of their record of military success and opposition to Persia, and warned them of the dangers of confronting such a powerful state, ultimately encouraging Sparta to seek arbitration as provided by the Thirty Years' Peace. Undeterred, a majority of the Spartan assembly voted to declare that the Athenians had broken the peace, essentially declaring war. Sparta and its allies, with the exception of Corinth, were almost exclusively land-based powers, able to summon large land armies which were very nearly unbeatable (thanks to the legendary Spartan forces). The Athenian Empire, although based in the peninsula of Attica, spread out across the islands of the Aegean Sea; Athens drew its immense wealth from tribute paid from these islands. Athens maintained its empire through naval power. Thus, the two powers were relatively unable to fight decisive battles. The Spartan strategy during the first war, known as the Archidamian War (431–421 BC) after Sparta's king Archidamus II, was to invade the land surrounding Athens. 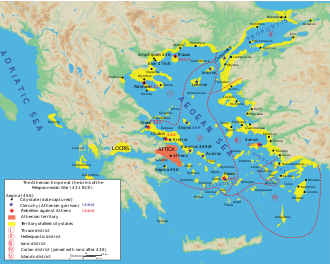 While this invasion deprived Athenians of the productive land around their city, Athens itself was able to maintain access to the sea, and did not suffer much. Many of the citizens of Attica abandoned their farms and moved inside the Long Walls, which connected Athens to its port of Piraeus. 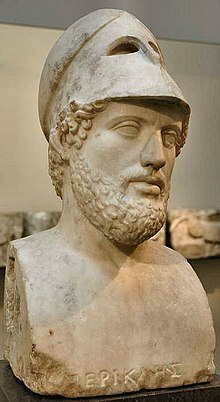 At the end of the first year of the war, Pericles gave his famous Funeral Oration (431 BC). The Spartans also occupied Attica for periods of only three weeks at a time; in the tradition of earlier hoplite warfare the soldiers were expected to go home to participate in the harvest. Moreover, Spartan slaves, known as helots, needed to be kept under control, and could not be left unsupervised for long periods of time. The longest Spartan invasion, in 430 BC, lasted just forty days. The Athenian strategy was initially guided by the strategos, or general, Pericles, who advised the Athenians to avoid open battle with the far more numerous and better trained Spartan hoplites, relying instead on the fleet. The Athenian fleet, the most dominant in Greece, went on the offensive, winning a victory at Naupactus. In 430 BC an outbreak of a plague hit Athens. The plague ravaged the densely packed city, and in the long run, was a significant cause of its final defeat. The plague wiped out over 30,000 citizens, sailors and soldiers, including Pericles and his sons. Roughly one-third to two-thirds of the Athenian population died. Athenian manpower was correspondingly drastically reduced and even foreign mercenaries refused to hire themselves out to a city riddled with plague. The fear of plague was so widespread that the Spartan invasion of Attica was abandoned, their troops being unwilling to risk contact with the diseased enemy. After the death of Pericles, the Athenians turned somewhat against his conservative, defensive strategy and to the more aggressive strategy of bringing the war to Sparta and its allies. Rising to particular importance in Athenian democracy at this time was Cleon, a leader of the hawkish elements of the Athenian democracy. Led militarily by a clever new general Demosthenes (not to be confused with the later Athenian orator Demosthenes), the Athenians managed some successes as they continued their naval raids on the Peloponnese. Athens stretched their military activities into Boeotia and Aetolia, quelled the Mytilenean revolt and began fortifying posts around the Peloponnese. One of these posts was near Pylos on a tiny island called Sphacteria, where the course of the first war turned in Athens's favour. The post off Pylos struck Sparta where it was weakest: its dependence on the helots, who tended the fields while its citizens trained to become soldiers. The helots made the Spartan system possible, but now the post off Pylos began attracting helot runaways. In addition, the fear of a general revolt of helots emboldened by the nearby Athenian presence drove the Spartans to action. Demosthenes, however, outmanoeuvred the Spartans in the Battle of Pylos in 425 BC and trapped a group of Spartan soldiers on Sphacteria as he waited for them to surrender. Weeks later, though, Demosthenes proved unable to finish off the Spartans. After boasting that he could put an end to the affair in the Assembly, the inexperienced Cleon won a great victory at the Battle of Sphacteria. The Athenians captured 300 Spartan hoplites. The hostages gave the Athenians a bargaining chip. After these battles, the Spartan general Brasidas raised an army of allies and helots and marched the length of Greece to the Athenian colony of Amphipolis in Thrace, which controlled several nearby silver mines; their product supplied much of the Athenian war fund. Thucydides was dispatched with a force which arrived too late to stop Brasidas capturing Amphipolis; Thucydides was exiled for this, and, as a result, had the conversations with both sides of the war which inspired him to record its history. Both Brasidas and Cleon were killed in Athenian efforts to retake Amphipolis (see Battle of Amphipolis). The Spartans and Athenians agreed to exchange the hostages for the towns captured by Brasidas, and signed a truce. With the death of Cleon and Brasidas, zealous war hawks for both nations, the Peace of Nicias was able to last for some six years. However, it was a time of constant skirmishing in and around the Peloponnese. While the Spartans refrained from action themselves, some of their allies began to talk of revolt. They were supported in this by Argos, a powerful state within the Peloponnese that had remained independent of Lacedaemon. With the support of the Athenians, the Argives succeeded in forging a coalition of democratic states within the Peloponnese, including the powerful states of Mantinea and Elis. Early Spartan attempts to break up the coalition failed, and the leadership of the Spartan king Agis was called into question. 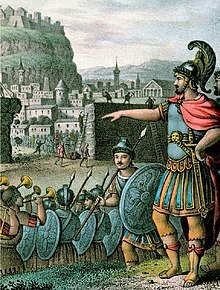 Emboldened, the Argives and their allies, with the support of a small Athenian force under Alcibiades, moved to seize the city of Tegea, near Sparta. The Battle of Mantinea was the largest land battle fought within Greece during the Peloponnesian War. The Lacedaemonians, with their neighbors the Tegeans, faced the combined armies of Argos, Athens, Mantinea, and Arcadia. In the battle, the allied coalition scored early successes, but failed to capitalize on them, which allowed the Spartan elite forces to defeat the forces opposite them. The result was a complete victory for the Spartans, which rescued their city from the brink of strategic defeat. The democratic alliance was broken up, and most of its members were reincorporated into the Peloponnesian League. With its victory at Mantinea, Sparta pulled itself back from the brink of utter defeat, and re-established its hegemony throughout the Peloponnese. Destruction of the Athenian army at Syracuse. In the 17th year of the war, word came to Athens that one of their distant allies in Sicily was under attack from Syracuse. The people of Syracuse were ethnically Dorian (as were the Spartans), while the Athenians, and their ally in Sicilia, were Ionian. The Athenians felt obliged to assist their ally. The Athenians did not act solely from altruism: rallied on by Alcibiades, the leader of the expedition, they held visions of conquering all of Sicily. Syracuse, the principal city of Sicily, was not much smaller than Athens, and conquering all of Sicily would have brought Athens an immense amount of resources. In the final stages of the preparations for departure, the hermai (religious statues) of Athens were mutilated by unknown persons, and Alcibiades was charged with religious crimes. Alcibiades demanded that he be put on trial at once, so that he might defend himself before the expedition. The Athenians however allowed Alcibiades to go on the expedition without being tried (many believed in order to better plot against him). After arriving in Sicily, Alcibiades was recalled to Athens for trial. Fearing that he would be unjustly condemned, Alcibiades defected to Sparta and Nicias was placed in charge of the mission. After his defection, Alcibiades claimed to the Spartans that the Athenians planned to use Sicily as a springboard for the conquest of all of Italy and Carthage, and to use the resources and soldiers from these new conquests to conquer the Peloponnese. The Athenian force consisted of over 100 ships and some 5,000 infantry and light-armored troops. Cavalry was limited to about 30 horses, which proved to be no match for the large and highly trained Syracusan cavalry. Upon landing in Sicily, several cities immediately joined the Athenian cause. Instead of attacking at once, Nicias procrastinated and the campaigning season of 415 BC ended with Syracuse scarcely damaged. With winter approaching, the Athenians were then forced to withdraw into their quarters, and they spent the winter gathering allies and preparing to destroy Syracuse. The delay allowed the Syracusans to send for help from Sparta, who sent their general Gylippus to Sicily with reinforcements. Upon arriving, he raised up a force from several Sicilian cities, and went to the relief of Syracuse. He took command of the Syracusan troops, and in a series of battles defeated the Athenian forces, and prevented them from invading the city. Nicias then sent word to Athens asking for reinforcements. Demosthenes was chosen and led another fleet to Sicily, joining his forces with those of Nicias. More battles ensued and again, the Syracusans and their allies defeated the Athenians. Demosthenes argued for a retreat to Athens, but Nicias at first refused. After additional setbacks, Nicias seemed to agree to a retreat until a bad omen, in the form of a lunar eclipse, delayed any withdrawal. The delay was costly and forced the Athenians into a major sea battle in the Great Harbor of Syracuse. The Athenians were thoroughly defeated. Nicias and Demosthenes marched their remaining forces inland in search of friendly allies. The Syracusan cavalry rode them down mercilessly, eventually killing or enslaving all who were left of the mighty Athenian fleet. The Lacedaemonians were not content with simply sending aid to Sicily; they also resolved to take the war to the Athenians. On the advice of Alcibiades, they fortified Decelea, near Athens, and prevented the Athenians from making use of their land year round. The fortification of Decelea prevented the shipment of supplies overland to Athens, and forced all supplies to be brought in by sea at increased expense. 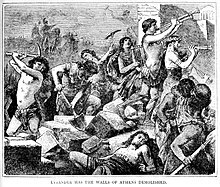 Perhaps worst of all, the nearby silver mines were totally disrupted, with as many as 20,000 Athenian slaves freed by the Spartan hoplites at Decelea. With the treasury and emergency reserve fund of 1,000 talents dwindling away, the Athenians were forced to demand even more tribute from her subject allies, further increasing tensions and the threat of further rebellion within the Empire. The Corinthians, the Spartans, and others in the Peloponnesian League sent more reinforcements to Syracuse, in the hopes of driving off the Athenians; but instead of withdrawing, the Athenians sent another hundred ships and another 5,000 troops to Sicily. Under Gylippus, the Syracusans and their allies were able to decisively defeat the Athenians on land; and Gylippus encouraged the Syracusans to build a navy, which was able to defeat the Athenian fleet when they attempted to withdraw. The Athenian army, attempting to withdraw overland to other, more friendly Sicilian cities, was divided and defeated; the entire Athenian fleet was destroyed, and virtually the entire Athenian army was sold off into slavery. Following the defeat of the Athenians in Sicily, it was widely believed that the end of the Athenian Empire was at hand. Their treasury was nearly empty, its docks were depleted, and many of the Athenian youth were dead or imprisoned in a foreign land. The triumphal return of Alcibiades to Athens in 407 BC. Following the destruction of the Sicilian Expedition, Lacedaemon encouraged the revolt of Athens's tributary allies, and indeed, much of Ionia rose in revolt against Athens. The Syracusans sent their fleet to the Peloponnesians, and the Persians decided to support the Spartans with money and ships. Revolt and faction threatened in Athens itself. The Athenians managed to survive for several reasons. First, their foes were lacking in initiative. Corinth and Syracuse were slow to bring their fleets into the Aegean, and Sparta's other allies were also slow to furnish troops or ships. The Ionian states that rebelled expected protection, and many rejoined the Athenian side. The Persians were slow to furnish promised funds and ships, frustrating battle plans. At the start of the war, the Athenians had prudently put aside some money and 100 ships that were to be used only as a last resort. These ships were then released, and served as the core of the Athenians' fleet throughout the rest of the war. An oligarchical revolution occurred in Athens, in which a group of 400 seized power. A peace with Sparta might have been possible, but the Athenian fleet, now based on the island of Samos, refused to accept the change. In 411 BC this fleet engaged the Spartans at the Battle of Syme. The fleet appointed Alcibiades their leader, and continued the war in Athens's name. Their opposition led to the reinstitution of a democratic government in Athens within two years. Encounter between Cyrus the Younger (left), Achaemenid satrap of Asia Minor and son of Darius II, and Spartan general Lysander (right), by Francesco Antonio Grue (1618-1673). Alcibiades, while condemned as a traitor, still carried weight in Athens. He prevented the Athenian fleet from attacking Athens; instead, he helped restore democracy by more subtle pressure. He also persuaded the Athenian fleet to attack the Spartans at the battle of Cyzicus in 410. In the battle, the Athenians obliterated the Spartan fleet, and succeeded in re-establishing the financial basis of the Athenian Empire. Between 410 and 406, Athens won a continuous string of victories, and eventually recovered large portions of its empire. All of this was due, in no small part, to Alcibiades. From 414 BC, Darius II, ruler of the Achaemenid Empire had started to resent increasing Athenian power in the Aegean and had his satrap Tissaphernes enter into an alliance with Sparta against Athens, which in 412 BC led to the Persian reconquest of the greater part of Ionia. Tissaphernes also helped fund the Peloponnesian fleet. Facing the resurgence of Athens, from 408 BC, Darius II decided to continue the war against Athens and give stronger support to the Spartans. He sent his son Cyrus the Younger into Asia Minor as satrap of Lydia, Phrygia Major and Cappadocia, and general commander (Karanos, κἀρανος) of the Persian troops. There, Cyrus allied with the Spartan general Lysander. In him, Cyrus found a man who was willing to help him become king, just as Lysander himself hoped to become absolute ruler of Greece by the aid of the Persian prince. Thus, Cyrus put all his means at the disposal of Lysander in the Peloponnesian War. When Cyrus was recalled to Susa by his dying father Darius, he gave Lysander the revenues from all of his cities of Asia Minor. Cyrus the Younger would later obtain the support of the Spartans in return, after having asked them "to show themselves as good friend to him, as he had been to them during their war against Athens", when he led his own expedition to Susa in 401 BC in order to topple his brother, Artaxerxes II. Lysander outside the walls of Athens. 19th century lithograph. The Spartan general Lysander has the walls of Athens demolished in 404 BC, as a result of the Athenian defeat in the Peloponnesian War. The faction hostile to Alcibiades triumphed in Athens following a minor Spartan victory by their skillful general Lysander at the naval battle of Notium in 406 BC. Alcibiades was not re-elected general by the Athenians and he exiled himself from the city. He would never again lead Athenians in battle. Athens was then victorious at the naval battle of Arginusae. The Spartan fleet under Callicratidas lost 70 ships and the Athenians lost 25 ships. But, due to bad weather, the Athenians were unable to rescue their stranded crews or to finish off the Spartan fleet. Despite their victory, these failures caused outrage in Athens and led to a controversial trial. The trial resulted in the execution of six of Athens's top naval commanders. Athens's naval supremacy would now be challenged without several of its most able military leaders and a demoralized navy. In 404 BC, the Athenian General Alcibiades, exiled in the Achaemenid Empire province of Hellespontine Phrygia, was assassinated by Persian soldiers, who may have been following the orders of Satrap Pharnabazus II, at the instigation of Sparta's Lysander. La mort d'Alcibiade. Philippe Chéry, 1791. Musée des Beaux-Arts, La Rochelle. Unlike some of his predecessors the new Spartan general, Lysander, was not a member of the Spartan royal families and was also formidable in naval strategy; he was an artful diplomat, who had even cultivated good personal relationships with the Achaemenid prince Cyrus the Younger, son of Emperor Darius II. Seizing its opportunity, the Spartan fleet sailed at once to the Dardanelles, the source of Athens's grain. Threatened with starvation, the Athenian fleet had no choice but to follow. Through cunning strategy, Lysander totally defeated the Athenian fleet, in 405 BC, at the Battle of Aegospotami, destroying 168 ships and capturing some three or four thousand Athenian sailors. Only twelve Athenian ships escaped, and several of these sailed to Cyprus, carrying the strategos (general) Conon, who was anxious not to face the judgment of the Assembly. Facing starvation and disease from the prolonged siege, Athens surrendered in 404 BC, and its allies soon surrendered as well. The democrats at Samos, loyal to the bitter last, held on slightly longer, and were allowed to flee with their lives. The surrender stripped Athens of its walls, its fleet, and all of its overseas possessions. Corinth and Thebes demanded that Athens should be destroyed and all its citizens should be enslaved. However, the Spartans announced their refusal to destroy a city that had done a good service at a time of greatest danger to Greece, and took Athens into their own system. Athens was "to have the same friends and enemies" as Sparta. The overall effect of the war in Greece proper was to replace the Athenian Empire with a Spartan empire. After the battle of Aegospotami, Sparta took over the Athenian empire and kept all of its tribute revenues for itself; Sparta's allies, who had made greater sacrifices for the war effort than had Sparta, got nothing. For a short period of time, Athens was ruled by the "Thirty Tyrants", and democracy was suspended. This was a reactionary regime set up by Sparta. In 403 BC, the oligarchs were overthrown and a democracy was restored by Thrasybulus. Although the power of Athens was broken, it made something of a recovery as a result of the Corinthian War and continued to play an active role in Greek politics. Sparta was later humbled by Thebes at the Battle of Leuctra in 371 BC, but the rivalry between Athens and Sparta was brought to an end a few decades later when Philip II of Macedon conquered all of Greece except Sparta, which was later subjugated by Philip's son Alexander in 331 BC. ^ a b c Bury, J. B.; Meiggs, Russell (1956). A history of Greece to the death of Alexander the Great. London: Macmillan. pp. 397, 540. ^ Kagan, The Peloponnesian War, 488. ^ Fine, The Ancient Greeks, 528–33. ^ Kagan, The Peloponnesian War, Introduction xxiii–xxiv. ^ In the Hellenic calendar, years ended at midsummer; as a result, some events cannot be dated to a specific year of the modern calendar. ^ Kagan, The Peloponnesian War, 45. ^ "The winter following Tissaphernes put Iasus in a state of defence, and passing on to Miletus distributed a month's pay to all the ships as he had promised at Lacedaemon, at the rate of an Attic drachma a day for each man." in Perseus Under Philologic: Thuc. 8.29.1. ^ Harrison, Cynthia (2002). NUMISMATIC PROBLEMS IN THE ACHAEMENID WEST: THE UNDUE MODERN INFLUENCE OF 'TISSAPHERNES'. pp. 301–319. ^ The Encyclopaedia Britannica: A Dictionary of Arts, Sciences, Literature and General Information. University Press. 1910. p. 708. ^ Xenophon. Tr. H. G. Dakyns. Anabasis I.I. Project Gutenberg. ^ Brownson, Carlson L. (Carleton Lewis) (1886). Xenophon;. Cambridge, Mass. : Harvard University Press. pp. I-2–22. ^ H.T. Peck, Harpers Dictionary of Classical Antiquities and W. Smith, New Classical Dictionary of Greek and Roman Biography, 39. ^ Roisman, Joseph; Worthington, Ian (2010-12-13). A Companion to Ancient Macedonia. John Wiley & Sons. p. 201. ISBN 9781405179362. Bagnall, Nigel. The Peloponnesian War: Athens, Sparta, And The Struggle For Greece. New York: Thomas Dunne Books, 2006 (hardcover, ISBN 0-312-34215-2). Cawkwell, George. Thucydides and the Peloponnesian War. London: Routledge, 1997 (hardcover, ISBN 0-415-16430-3; paperback, ISBN 0-415-16552-0). Hanson, Victor Davis. A War Like No Other: How the Athenians and Spartans Fought the Peloponnesian War. New York: Random House, 2005 (hardcover, ISBN 1-4000-6095-8); New York: Random House, 2006 (paperback, ISBN 0-8129-6970-7). Heftner, Herbert. Der oligarchische Umsturz des Jahres 411 v. Chr. und die Herrschaft der Vierhundert in Athen: Quellenkritische und historische Untersuchungen. Frankfurt am Main: Peter Lang, 2001 (ISBN 3-631-37970-6). Hutchinson, Godfrey. 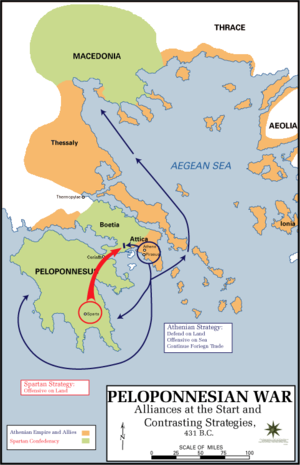 Attrition: Aspects of Command in the Peloponnesian War. Stroud, Gloucestershire, UK: Tempus Publishing, 2006 (hardcover, ISBN 1-86227-323-5). The Outbreak of the Peloponnesian War. Ithaca, NY: Cornell University Press, 1969 (hardcover, ISBN 0-8014-0501-7); 1989 (paperback, ISBN 0-8014-9556-3). The Archidamian War. Ithaca, NY: Cornell University Press, 1974 (hardcover, ISBN 0-8014-0889-X); 1990 (paperback, ISBN 0-8014-9714-0). The Peace of Nicias and the Sicilian Expedition. Ithaca, NY: Cornell University Press, 1981 (hardcover, ISBN 0-8014-1367-2); 1991 (paperback, ISBN 0-8014-9940-2). The Fall of the Athenian Empire. Ithaca, NY: Cornell University Press, 1987 (hardcover, ISBN 0-8014-1935-2); 1991 (paperback, ISBN 0-8014-9984-4). The Peloponnesian War. New York: Viking, 2003 (hardcover, ISBN 0-670-03211-5); New York: Penguin, 2004 (paperback, ISBN 0-14-200437-5); a one-volume version of his earlier tetralogy. Kallet, Lisa. Money and the Corrosion of Power in Thucydides: The Sicilian Expedition and its Aftermath. Berkeley: University of California Press, 2001 (hardcover, ISBN 0-520-22984-3). Kirshner, Jonathan. 2018. "Handle Him with Care: The Importance of Getting Thucydides Right." Security Studies. Krentz, Peter. The Thirty at Athens. Ithaca, NY: Cornell University Press, 1982 (hardcover, ISBN 0-8014-1450-4). The Landmark Thucydides: A Comprehensive Guide to the Peloponnesian War, edited by Robert B. Strassler. New York: The Free Press, 1996 (hardcover, ISBN 0-684-82815-4); 1998 (paperback, ISBN 0-684-82790-5). 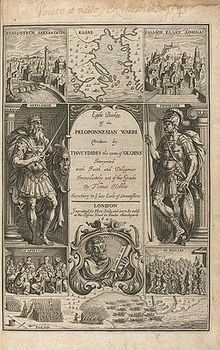 Wikimedia Commons has media related to Peloponnesian War. "Peloponnesian War" . Encyclopædia Britannica. 21 (11th ed.). 1911. This page was last edited on 11 March 2019, at 04:56 (UTC).